Tomorrow Elk Grove Mayor Gary Davis will leave office. In honor of his last 12 days in office, we will take a look back at some of the most memorable aspects of Davis' tenure. No review of Mayor Gary Davis' time in office would be complete without a look back at his forays into at least three known business ventures. All three of the businesses Davis started were done during his tenure as Mayor. Although the best known of Davis' three endeavors was Grace Coffee Roasters, readers may have forgotten he started a venture that attempted to partner with a company that had done business with the City of Elk Grove. That company was called Civic Innovations Public Affairs (CIPA). As reported on Elk Grove News in November 2013, Davis had filed a fictitious business name with Sacramento County in April 2013. According to CIPA's website, which is not longer active, they provided "common sense innovation for local government" and were affiliated with three firms, including a company called Public Stuff. Public Stuff was listed on the City of Elk Grove's website as the developer of the city's app in 2011. Although no abandonment of the CIPA name has been filed with Sacramento County, there is no indication this is an ongoing business. Following the CIPA endeavor, Davis took on his biggest challenge in opening Grace Coffee Roasters in January 2014. Shortly after that Davis expanded Grace from its drive-thru kiosk on Elk Grove-Florin Road and Elk Grove Boulevard to two stores - one in western Elk Grove and the other in Downtown Sacramento. It wasn't too long before Davis sold off these businesses. Perhaps Davis came to the realization there were not enough hours in the days to make payroll, work full-time for California Charter School Association, and perform his Mayoral duties. This might explain why he insisted on hiring a full-time assistant. Now we don't begrudge a guy trying to make some extra scratch for his family. 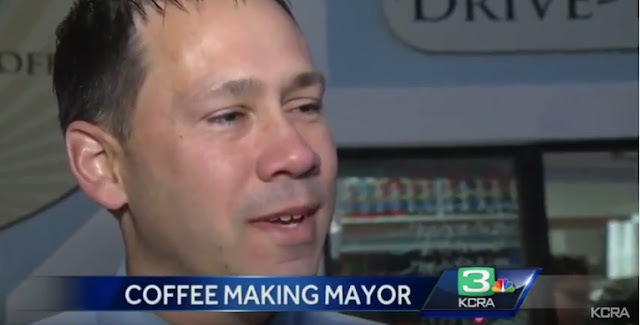 However, the Mayor does need to be held to account for his actions surrounding Grace Coffee Roasters. First there was all the free advertising he got on local TV news. If that was some ordinary schlup in Elk Grove, do you think KCRA would ever consider giving them that sort of coverage? No way! Not only was it undignified, but it also verged on breaching the spirit of the Elk Grove City Council's Code of Ethics. Furthermore, the Mayor was deceptive when telling the TV talking heads and their thousands of viewers how he raised his money. Davis told the media that yes, he had sold his Starbucks stock to buy the original location. What a great story, right? The problem was, Davis never reported owning Starbucks stock on any of his Statements of Economic Interests dating to 2006 when he was first elected. If Davis did own Starbucks stock, it would have been less than the $1,000 reporting threshold, which certainly would not be enough to start a coffee venture. At a minimum, this was an exaggeration, at worse, an outright lie. For good measure, the Mayor has recently launched his third business, a community information website called Elk Grove Tribune. Word on the street, the Mayor started this business to be a counterbalance to other sites in Elk Grove. Described by one observer as a "Puppies and Rainbows" site, the Mayor launched it with great fanfare emailing apparently everyone on any one of his email list. We extend the Mayor good wishes in this undertaking but would offer a few tidbits of advice. First, running a website take a tremendous amount of time for very little money. So if you are running it in hopes of scoring a significant financial gain, unless you have a few hundred thousand followers on a daily basis, it ain't gonna happen. Secondly, if you want to develop an audience, even a limited local one, your information site needs to be updated on a daily, or even a near daily basis. As of this posting, it looks like the last entry on the EGT was one week ago. Not real fresh.